Hmmmmm. Another puzzling month. I think I've nailed down the top two pretty well, but after that there are a lot of things that could happen. Small openings could move up and some potential successes could fall by the wayside. I'm sure that even some of the wide releases that I left out of my top ten could sneak their way onto the charts. Let's move on to my top ten for August 2006. Nicolas Cage teams up with director Oliver Stone in this latest film about the heroes who emerged on September 11, 2001. The last film focused on the plane that was crashed in Pennsylvania. This one goes to the first site of the terrorist attacks on that day. I think the backing and experience of Stone will definitely help push this film up to the top. The commercials and trailers have been very moving and powerful, giving audiences an idea of what they can expect. There is some major product tie-in marketing going on here. 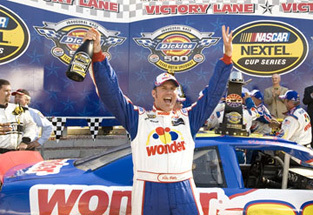 In addition to the Wonder Bread car that Will Ferrell is driving in the film there's Ricky Bobby watching himself on a Sprint phone, as well as other commercials with Ferrell as his on-screen persona. We also have the interest that will come from NASCAR fans. The power of that group is pretty impressive. The rise in popularity of stock car racing has brought larger television contracts. The studio is hoping that crosses over to the silver screen. This should prove a pretty successful film for Mr. Ferrell. Even though this film opens just a couple days after World Trade Center, I think it will benefit from having a different audience than that movie. Tim Allen has proven himself as a solid attraction when it comes to family films. I think people sense that he is enjoying making them. Even though he's been doing these family pictures, he hasn't let himself work in only one specific type of family film. He's given us a variety of roles and people enjoy seeing him no matter who he has portrayed. This film about a made-up college for rejects of "quality" schools has the potential to do very well. As you can guess, the usual young adult crowd will be out in force to see this film. But I think there's another factor that people may be leaving out. This doesn't look like a totally dumb college film. It appears that the studio has toned it down just a bit and this may allow the audience demographic to shift just a bit higher in age. This expansion will lead to a bit more revenue for the studio and push it up a ways in the charts. Doesn't leave the potential viewer guessing what this film's going to be about, does it? Combine the catchy title with star Samuel L. Jackson and you've got a solid hit on your hands.